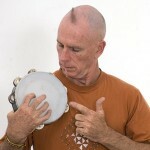 Greg Sheehan is a Rhythm Magician. His astounding musicality and passion shines brilliantly through the instruments he plays. He is firmly in the realm of Australia&apos;s great musical innovators, with his propensity for experimentation and exploration of rhythms and the instruments he plays. Here, Greg plays with Squeaky Toys.